I made this photograph from the roof of a lurching freight train in Chiapas, Mexico, where I perched along with 60 other stowaways – all illegal immigrants from Central America. For weeks I’d been riding northbound freights through Mexico to document the journey of Honduran children hoping to reunite with mothers who’d left them behind to find work in the U.S. 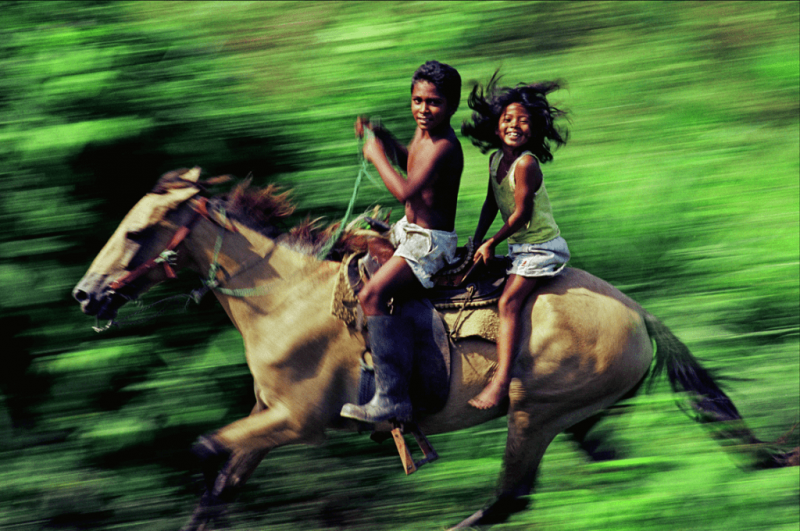 Appearing out of the countryside, a boy and girl gallop their horse alongside the train. The race brought cheers and laughter from those clinging to the top of the train – rare moments of joy shared with migrants bound to El Norte. This image is part of my photo essay that was awarded the 2003 Pulitzer Prize. I’ve been a photojournalist for 36 years, the past 25 with the Los Angeles Times. The story of migration across the U.S./Mexico border has been my documentary focus since 1980. Much of my energy remains dedicated to expanding this body of work for contemporary reflection and historical preservation. “The Roads Most Traveled – Photographs of Migration by Don Bartletti” was presented as a major exhibit by the Museum of Photographic Arts in San Diego and is now at the Tijuana Cultural Center.